Apart from interaction with artists such as Cyprian Shilakoe (qv. ), Bill Ainslie and Fikile Magadlela, it was Moyaga’s mother who played the dominant role in his formation as an artist. She kept alive their traditional religion alongside Christianity. Consequently, her death was a traumatic experience. Moyaga believes that her influence still sustains him in his quest to express the link between daily life and the ancestral presence. In about 1971, when he took his first job at a business concern in Polokwane (Pietersburg), Moyaga began to make drawings that mirrored his spiritual experiences. Once, on an errand to a client’s house, he chanced to see a fascinating painting. This led to a conversation between Moyaga and the client, who asked Moyaga to show him some drawings. He bought one of them and then introduced Moyaga to Brother Bral, who became his first teacher. Moyaga worked at two tourist shops before he moved to Francistown in Botswana where he now lives. The first was at Papatso, near Hammanskraal, and the second in Pretoria at a souvenir shop in Hatfield, where he modelled in clay. These models were cast in bronze for the tourist market. While working at Papatso he met Cyprian Shilakoe (qv.) with whom a friendship ensued and with whose art he sincerely identifies. Nkoane Moyaga, like Fikile Magadlela, Leonard Matsoso (qv.) 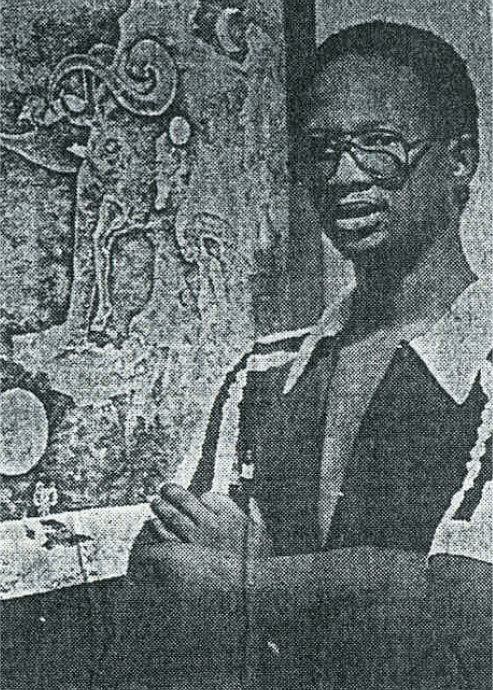 and Thami Mnyeli responded to the call of the Black Consciousness movement as articulated by Steve Biko: ‘… black consciousness has to be directed to the past … to rewrite the history of the black man and to produce in it the heroes who form the core of the African background’.1 In line with their convictions they explored the beauty of being black. Instead of representations of poverty in the townships and an oppressed people, they interpreted and celebrated their legendary past. They developed unique techniques of mark-making which differ from conventional hatching, crosshatching and shading. Moyaga applies a technique, reminiscent of pointillism. These dots radiate rays to simulate tiny stars, dandelion seeds or seeds of the bidens species. By using signs resembling either celestial bodies or vegetation, Moyaga links sky and land to symbolize the endless universe and infinite life. Before Moyaga begins to work, he meditates until he establishes contact with the ancestral spirits. Only when he has merged with them does he paint the visions they have inspired in him. In Modimogadi wa nong (plate 219) he interprets the supremacy of the Northern Sotho deity, Modimogadi, the Great Mother. Though she protects all living beings, provides food and rules the rainfall, in this instance she appears as the vulture-goddess. Of all the birds, she has endowed the vulture with the keenest olfactory sense. Now merging with the vulture, which is her male counterpart, she leads him to a feast of abundance. There he will rip the liver from the carcass and devour it; then the other birds, already advancing, will join them. Stubbs, A, (ed.). 1979. I Write what I Like: Selected Writings of Steve Biko. Bowerdean Press: London. p. 29. Born,/b> Polokwane, Limpopo, 1954. Training 1971-1976: Private Art School of Brother Bral, a Roman Catholic priest, Polokwane. c. 1977: Bill Ainslie Studios, Johannesburg. Exhibitions 1976: Solo exhibition, Nedbank Building, Killarney, Johannesburg; Solo exhibition, Australian Embassy, Pretoria. 1977: Solo exhibition, Stuttgart, Germany. 1978: Man, Beast and Ancestors, Waterfront Gallery, Cape Town; World in conflict, SAAA, Pretoria. Impande yo siko (Roots of heritage), French Embassy, Pretoria. 1980: Lidchi Gallery, Johannesburg. 1981: Black Art Today, Standard Bank, Jabulani, Soweto. 1982: Art toward social development. An Exhibition of South African Art, National Museum and Art Gallery, Gabarone, Botswana. 1995: Solo exhibition, Gauteng Art Gallery, Caroline Street, Brixton, Johannesburg. Collections De Beers Centenary Art Gallery, University of Fort Hare, Alice. Photograph of Harry Moyaga. Source: The Argus, 23 April 1980, p.7.